I can't remember any other Kijiji ad featured here that made me want to go to any length to rescue the item and make it mine. Reader Brad (thanks Brad!) sent in this ad for a Donkey Kong album. What is this I don't even....but I want it. I don't live near Ottawa, but I want it. 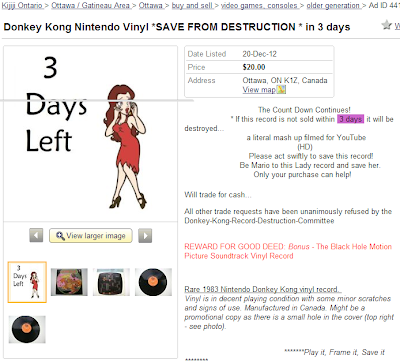 And it's urgent because if someone doesn't buy this Donkey Kong vinyl LP for just $20, the owner says he will smash it in a HD YouTube video. I hope that doesn't happen, but if it does, I'll sadly post the video here. Here, read the ad. Please act swiftly to save this record! 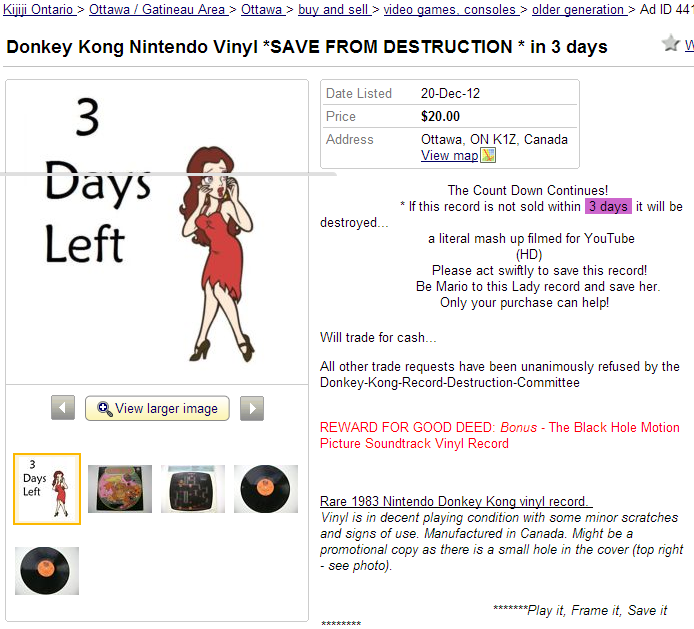 Be Mario to this Lady record and save her. Only your purchase can help! Rare 1983 Nintendo Donkey Kong vinyl record. Vinyl is in decent playing condition with some minor scratches and signs of use. Manufactured in Canada. Might be a promotional copy as there is a small hole in the cover (top right - see photo).